Ooh you do have some fab embossing folders Di! This card is really fab and such a great Christmassy image! Definetely makes me think of xmas! Ooh I love Vivs card too! Right up my street I must pop over! Hi Di...looks like I just might be first. I have been working away at my UFO cards and so have a few finished up now...Yay! Fairly simple but finished cards, nevertheless. OMGoodness - I won! Yay! I can't believe it! Thank you, Di! I will email you shortly! So excited! Your card is adorable! I love that embossing folder! Congratulations to this week's picks - so beautiful - I always enjoy seeing them! The prize looks fabulous - I'll say Yes to the prize but I know lightning won't strike twice LOL! Thank you! Thank you to Vicky for supplying the prize! Very generous and very much appreciated! I looked back to see what I won - very excited!!! Cute card Di and congratulations to Kitty. Hugs Mr A. What gorgeous cards from everyone! And your card is beautiful - love the embossing folder you've used. Needless to say, I'm playing for fun this week! Lovely card Di the simplicity adds to it's attraction. yes to the prize please. Gorgeous card! That image is so adorable and I love how you kept the color palette so simple and effective. Thanks so much for joining us at Merry Monday. Love your make this week, the white embossed background is just fab. Just uploaded my make - just playing for fun this week! 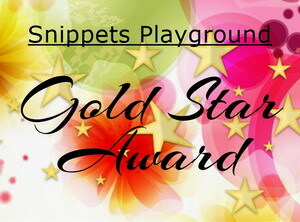 Your Snippets Card is fab Di. Love the embossing and the sweet image popping off the page in a red mat. Congrats to the showcased girls and to K for winning a prize. A lovely card Di, a cute image and fabulous embossing folder. I would love to have a chance of winning this week's prize and will be in the playground soon. I love your card that showcases that beautiful embossing with a smaller image! Great idea Di! 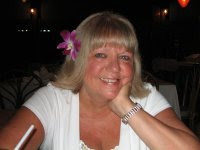 Congrats to Kitty (woot!) for her win, and oh my - the featured cards are SO wonderful this week - just like every other week! I'm playing just for fun this week, but thanks for offering such a great prize package! Lovely cards. I saw your Christmas card on Merry Monday. Beautiful CAS from you, the embossed background looks great! And pretty compilation of cards, all lovely!! 3 for 1 sounds good--gonna try to do that. I've never entered at Rudolph Days & this might be the time to start. Your card is darling, Di & I love the picks! Yah for Katie! Too funny this happened right after your comments! Leave me out of the drawing, please. Gorgeous make there Miss and lovely pics. Specially love the chookie bag. Lovely Christmas card there. I agree, the embossing folder is very cool. So glad you have a pair of hedgies in the yard!! The snow is finally gone from my yard. I need to some cleaning up in the beds and then wait until mid May for planting. Hope you and Len are having a great day. This is such a sweet little angel with her stack of Christmas gifts! Love that embossed background too! 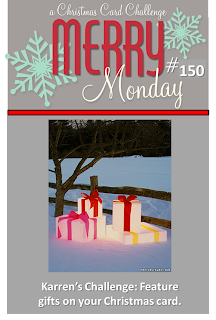 Thanks for sharing with us at Merry Monday! 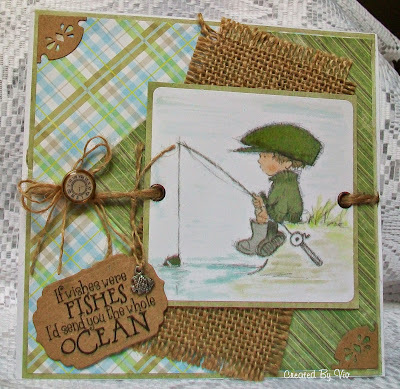 Beautiful and crisp embossing and a very sweet image, a pretty creation!! Beautiful pics always!!! Yes for the lovely prize! Yes to the prize if I'm lucky. Another week of super fave picks. Congrats to Kitty on her win. Your card is wonderful, and that embossing is great. It's lovely to hear you coloured the image with whisper pens as you don't hear of them much now, and I have quite a few of them. Thank you for all your hard work involved in this challenge, and thank you Jane for the prize donated. Such a pretty image and very lovely embossing. Just stopped bt again to say your card here is stunning! That EF is superb and hi lights your image wonderfully. Brilliant card Di, love the image and I think I need that embossing folder. 3 great picks. Iggy's gone, broke my heart, I wasn't going to let him go as the place was full of pine tree and quite dry and barren land but after walking around found what they called the Nature reserve, which was really green and pretty I decided I would let him go there, it was a better place, I shed a little tear and told him that it was all Parsnips fault and to beware of any Teddy Bears he happens to come across in the future. Love your crisp and clean Merry Monday card! I'm thinking of having a snippets bonfire before they take over the planet. Such a sweet card. I love the embossed background. Definitely deserving of the honorable mention. Dropped by with another card. Yes please to the prize! Possession is nine tenths of the law so them there snippets was mine!! Hugs mrs A. Time certainly flies when you are having fun - hope it is OK to put another stitched snippet project in (only playing for fun). I must get back to the card and paper though!! 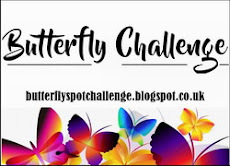 Just entered my 2nd take on your snippets challenge matey - still playing for fun! Hi Di I am still getting the Internal Error message so here is my blog link! 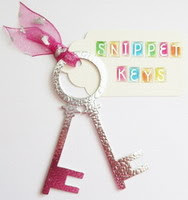 It's the second card with the snippets on! Playing just for fun this week! Hello Miss! Am late this week - and I thank you so much for showcasing little fishy wishes boy. Had forgotten to link this weeks offering but remembered this morning whilst sulking on the swings so now added linked. Yes please to this weeks goodies. Another lovely selection of picks and congratulations to Kitty on her win. I wouldn´t normally go for a script embossing folder but that one looks really good - perhaps because the image is small enough to make enough of the words readable. It´s a cute little angel too. Hello Miss Di, sorry for absence, not been good Miss am housebound too, grrr! Not surprised your lurverly Crimbo card got you an Honourable Mention is stonking! Your box card ain't arf clever too Miss - I think I would get told off if I tried to do that cos the old geezer don't like it when I don't arf swear!